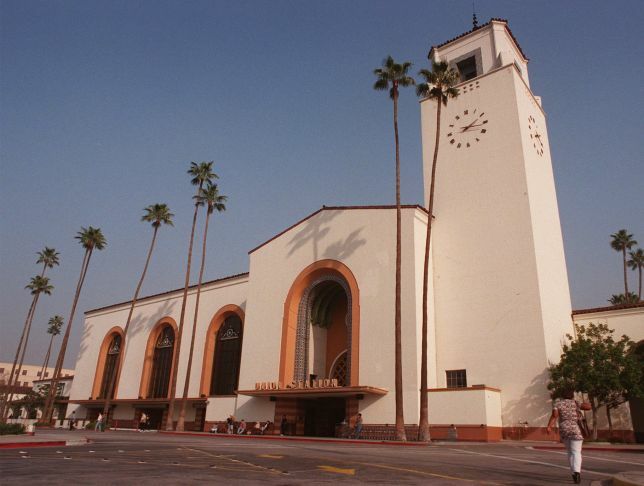 Union Station in Los Angeles is celebrating its 75th anniversary. The gorgeous Mission Revival structure is the focus of a summer exhibit at the Los Angeles Public Library: “No Further West: The Story of Los Angeles Union Station,” as Dan Allen notes in Westways, the magazine of the Automobile Club of Southern California. The station manages to make public transportation through downtown L.A. somewhat less onerous. There are the typical hazards associated with train stations, but there is also a lightness and freshness to the structure, whose ornate waiting room opens onto sun-drenched, mosaic-tiled and garden courtyards east and west. As with much else in Los Angeles, much of what appears on the surface is not quite the reality. The wooden timbers in the waiting room are painted steel, and the connection to San Francisco stops in San Jose (a problem for California’s high-speed rail project as well). Yet there is much in Union Station to enjoy for what it is.